These films were nominated for 2012 YoungCuts Best Documentary Film. Farmer, an environmental activist, decides to tree-sit. Joe Caputo copes with his job as a forensics photographer with art. Bee Keeping is Bill Walter's passion. The things that give Jérémy the will to live. Tom O'Key discovers his purpose under the stars. Where Did All the Bagels Go? In 2010, the last traditional kosher bakery in Leeds closed down. Winner of Best Documentary at the 2012 YoungCuts Film Festival was The Beautiful Dead by Spencer Ryerson (Canada). Congratulations to Spencer and best of luck on his future projects! 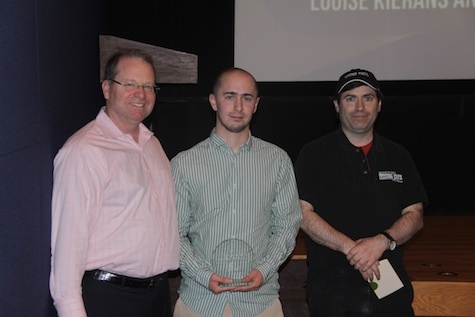 Pictured is Spencer Ryerson accepting the award from YoungCuts chairman Jay Moulton (on the left) and YoungCuts Festival Director (on the right).